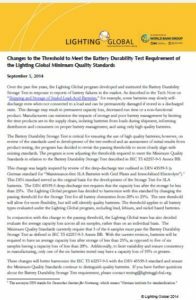 Over the past few years, the Lighting Global program developed and instituted the Battery Durability Storage Test in response to reports of battery failures in the market. As described in the Tech Note on “Shipping and Storage of Sealed Lead-Acid Batteries,” for example, some batteries may slowly self-discharge even when not connected to a load and can be permanently damaged if stored in a discharged state. This damage may result in permanent capacity loss, decreased run time or a non-functional product. Manufacturers can minimize the impacts of storage and poor battery management by limiting the time products are in the supply chain, isolating batteries from loads during shipment, informing distributors and consumers on proper battery management, and using only high quality batteries. The Battery Durability Storage Test is critical for ensuring the use of high quality batteries; however, on review of the standards used in development of the test method and an assessment of initial results from product testing, the program has decided to revise the passing thresholds to more closely align with existing standards. The program is now adjusting the thresholds required to meet the Minimum Quality Standards in relation to the Battery Durability Storage Test described in IEC TS 62257-9-5 Annex BB.